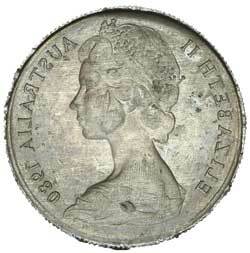 ELIZABETH II, five cents, 1980, full obverse brockage. Nearly uncirculated and rare thus. Ex Noble Numismatics Sale 110 (lot 285). 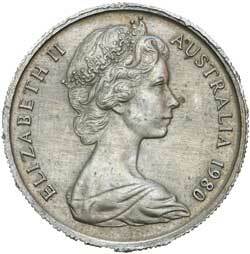 ELIZABETH II, twenty cents, 1981, three and a half claw variety. Nearly uncirculated.